Mikhail Kolyada performs his long program at 2017 Russian Nationals. Mikhail Kolyada was Russia’s male shooting star last season when he came in fourth in his debut at the 2016 ISU World Figure Skating Championships in Boston, Mass. 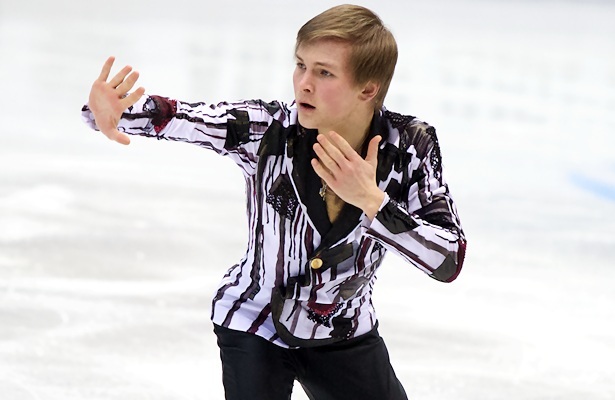 This season, the 22-year-old from St. Petersburg was assigned to two Grand Prix events for the first time in his career, and was considered a favorite for qualifying for the 2016-17 ISU Grand Prix of Figure Skating Final. Unfortunately, the skater missed out when he only placed fourth at Rostelecom Cup and fifth at NHK Trophy. Nevertheless, Kolyada then proved that he is still a force to be reckoned with when he won his first national title with two strong performances last month. Kolyada was pleased with his performances at Nationals in Chelyabinsk, despite some wobbles and a fall on a quad Lutz in the free. Even a little incident didn’t distract the skater – in the middle of his free program an advertising video of a sponsor suddenly started, complete with sound. The fall on his opening quad Lutz didn’t bother the 2016 Russian silver medalist too much, either. In Chelyabinsk, when he finished his long program to music from Cirque du Soleil, Kolyada had a big smile on his face, however, he couldn’t be sure whether it was enough to win. However, there was no doubt that in the end, it was a clear and well-deserved victory over newcomer Samarin and defending champion Maxim Kovtun. After nationals, Kolyada enjoyed a short rest and time with his parents and three younger siblings as New Year’s Eve is the biggest holiday in Russia. Afterwards, the skater had to get back to work right away. On January 2, he, along with his coach Valentina Chebotareva and other skaters from his group, went to Finland for a training camp. The goal for the upcoming 2017 ISU European Figure Skating Championships in Ostrava, Czech Republic, is to skate well, improve on his fifth-place finish from last year, and to land the quad Lutz for the first time in competition. No European skater has yet landed a clean quad Lutz in competition, although a few, including Evgeni Plushenko, have tried. In practice, Kolyada has produced some amazing quad Lutzes. He doesn’t think that nervousness makes it harder to land a new jump in competition. Obviously, the new Russian Champion is a medal contender for Europeans and he wants to be ready for the challenge. “I will prepare for Europeans as usual – maybe even harder than usual,” Kolyada said and smiled.